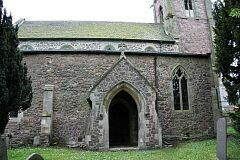 The church has a perpendicular west tower, C13th north arcade, C13th north doorway, early C14th south arcade and C14th south doorway and chancel arch. 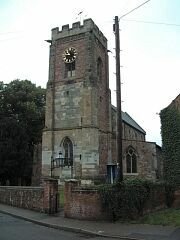 The church was restored 1890-91. Church. C13-C15, restored and chancel rebuilt C19. Granite rubble stone with stone dressings and Swithland slate roof. 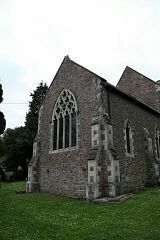 Stone coped gables, some with cross finials. West tower, nave, aisles, chancel and north and south porches. Perpendicular west tower of 3 stages with clasping buttresses, west window, loopholes in second stage, four 2-light bell openings, quatrefoiled lozenge frieze, remains of gargoyles, and battlements. 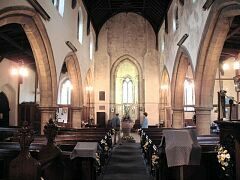 Inside, a double chamfered nave arch on semi-circular responds. C13 (?) bay north arcade with double chamfered arches on circular piers. Early C14 three bay south arcade with double chamfered arches on octagonal piers. 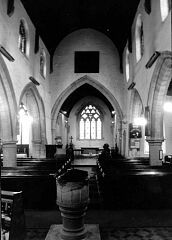 Perpendicular clerestory with four windows either side, two to west of 2-lights, two to east of 3-lights. C19 roof with curved braces to collars. 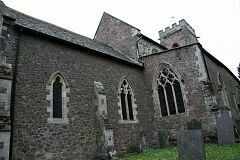 In north aisle, four windows with Reticulated tracery, north door and porch. Piscina and aumbry. Double chamfered chancel arch on responds with fillets. North and east windows with stained glass of 1881, others with tinted glass. C19 boarded roof. Medieval altar stone remounted mid C20. In south aisle, three windows with Reticulated tracery and east window with plate tracery. Rood loft arch near. Piscina and square niches. Pieces of C18 panelling, probably from old box pews, against wall. South doorway with many-moulded arch and south porch of 1889. Circular Norman font, blank arcading with colonettes carrying segmental arches. C19 base. Interior retains two old chests, Royal arms on panel over chancel arch and two early C19 musical instruments, an ophicleide and a serpent. Pevsner. 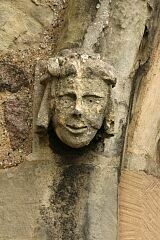 Project Gargoyle survey work in 2011 recorded a set of rather worn gargoyles on the 14th Century tower. 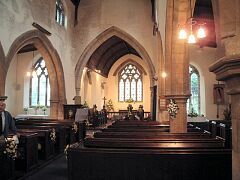 Most of the windows of the aisles and chancel have label stops. 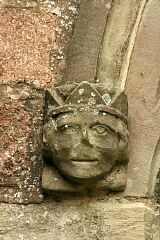 Some of these are 13th or 14th Century, although most are probably Victorian restorations. 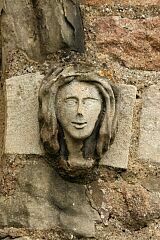 On the north aisle north wall is a pair of human heads, one of which might depict a leper and the other possibly someone suffering from facial paralysis (see images 1920 to 1924). These presumably are contemporary with the 13th Century north aisle. No internal carvings. 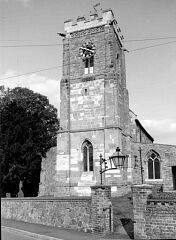 <1> Pevsner N, 1984, The Buildings of England Leicestershire and Rutland, p371 (Bibliographic reference). SLE4. 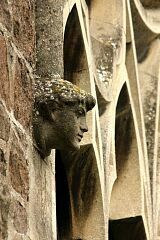 "Granite-faced. Perp W tower with clasping buttresses and a quatrefoiled lozenge frieze below the battlements. Tall, narrow arch to the nave. C13 N arcade with circular piers, circular abaci, and double-chamfered arches. N doorway probably also C13. Early C14 S arcade with octagonal piers and double-chamfered arches. 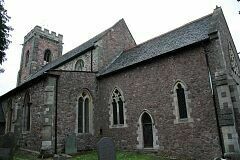 C14 also the S doorway and chancel arch (filleted responds). Aisle windows with renewed reticulated tracery except for the S aisle E window; much renewed two-light plate tracery with a quatrefoil in the head. Perp clerestory. Chancel rebuilt as part of E H Lingen Baker's restoration of 1890-1. - FONT. Norman, circular, with crude arcade with segmental arches. - STAINED GLASS. E window by Popper & Boyes, London, 1891. - Chancel NW by Burlison & Grylls, 1891. 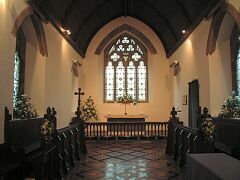 - The other chancel windows, also of 1891, have 'Muranese' glass, that is frosted tinted glass, used here for the first time in a church, according to a contemporary account. - MUSICAL INSTRUMENTS. Serpent and ophicleide, early C19." 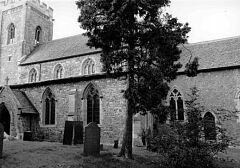 <2> Hunt, Leon & Patrick, Jamie, 2013, An archaeological watching brief during groundworks at All Saints Church, Church Street, Seagrave (Unpublished document). SLE4385. 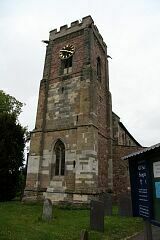 A watching brief was carried out in 2013 during the excavation of a trench around the north, east and south sides of the church. No archaeological features were found. Disarticulated human bone was recorded on the southern side around the porch, presumably disturbed during construction of later buttresses. A single articulated burial was recorded during excavations for a manhole just to the east of the porch. <1> Bibliographic reference: Pevsner N. 1984. The Buildings of England Leicestershire and Rutland. p371. <2> Unpublished document: Hunt, Leon & Patrick, Jamie. 2013. 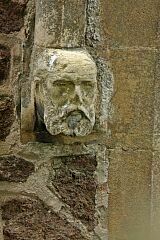 An archaeological watching brief during groundworks at All Saints Church, Church Street, Seagrave.